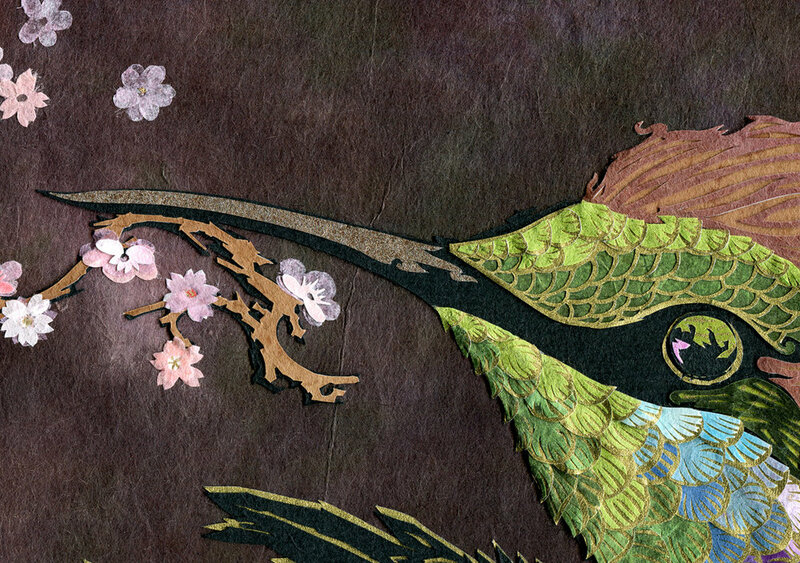 Just shy of two years ago, Arts Rush Gallery held their first Kachofugetsu • 花鳥風月 exhibition. My life has changed dramatically since that time, both professionally and personally. Funnily enough, the one thing that hasn't changed in that time is the artwork I planned to show at the event, a detail of which you can see above. I'd never made a piece quite like it, and it took a whole lot longer to fashion than I could have imagined. About two years, as it turns out. Sorta kinda. What I failed to mention is that Kachofugetsu shouldn't be literally assumed to mean art of flowers wafting in the wind, while birds flutter under the glowing moon. Rather, these images evoke a tradition, a history, a lineage of the appreciation of nature and beauty reflected in art and passed down through generations. Traditions are as much a trap as a gift. Its an easy mistake to replicate what came before without adding our own essence into the mix. When we stand on the shoulders of titans, we need to accept the responsibility of moving those traditions forward, of evolving them. This year, seven of us are trying our hands at interpreting these themes for our increasingly strange times.